This week will forever go down in history as one of the BEST WEEKS EVER. Why is that you ask? Well, yesterday I flew to my favorite food-land in the whole country – Wisconsin (doiiii) – for a week of cheese life. As you know, I’m a huge fan of American made cheeses and the people of Wisconsin have been so welcoming and generous and um, to be honest, they feed me really, really well so I love them. I’m also pretty much obsessed with Madison, WI and will move here when I get too sick of subways, rats, and cramped living. But the reason I came out here wasn’t to gorge myself on cheese or to drown my NYC sorrows in locally crafted beer -which to be totally honest is my favorite tradition of my Wisco trips. I came out here because over the last few months, I’ve been a spokesperson for Wisconsin Cheese and a promoter of Grilled Cheese Academy’s recipe contest that just went down today. It was amazing and if you’ve been following my instagram, you already know that a few grilled cheese fiends and I tasted a bunch of insane gc’s this morning and rated them for taste, look, incorporation of cheese, and creativity. And even though you might think that tasting the grilled cheese was the best part, we’re actually going to reward some lucky lad with TEN THOUSAND DOLLARS for their recipe which is so amazing. That’s a whole lot of money and I would literally die if I won it – so just sayin’ if you entered I HOPE YOU WON and I’ll give you mouth to mouth if you die of excitement! Oh and I must do a shameless plug here, because this trip also incorporates one of my other favorite things to do in the world …. eh hem POP-UPS. Whoo!!! So if you live in Madison or even like 5 hours away and have a car, then you must come to one of my grilled cheese pop-ups at Underground Butcher this Saturday and Sunday from 11-3 (here’s an invite!). 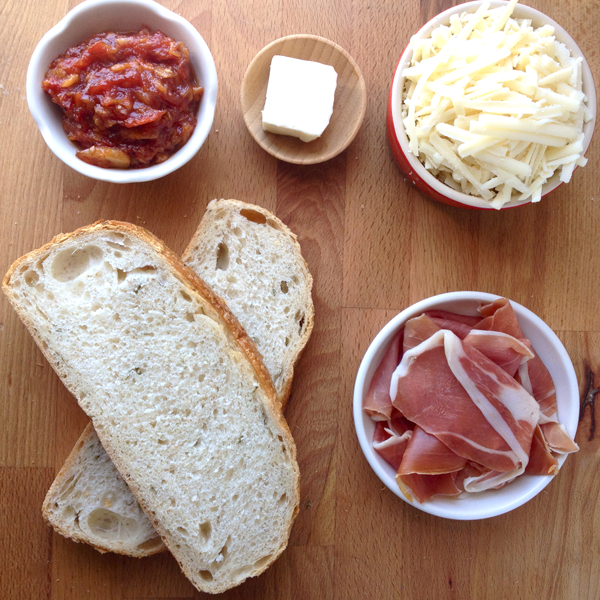 It’s going to be amazing and I’m going to be grillin’ up this original recipe that features ho’made candied garlic and tomato chutney, Switzerlands’s own Emmi Gruyere, jamon serrano (I’ll be using their house made ham and bread for the pop-up just FYI) and rosemary sourdough. Ok, so to begin, I started by grating some of my favorite Gruyere by Emmi Switzerland. It’s nutty, rich, a lil sweet and its got these perfect little crystals that just make you keep eating it until you have to give all your clothes away because they don’t fit anymore. But I digress and that’s totally a projection of my current problems – SO, anyways – you def need to try this American made cheese because it will blow your mind. And if you can’t find Emmi Gruyere, then it’s probably a good idea to search for their American counterpart Roth’s Grand Cru… which is pretty much the same thing. 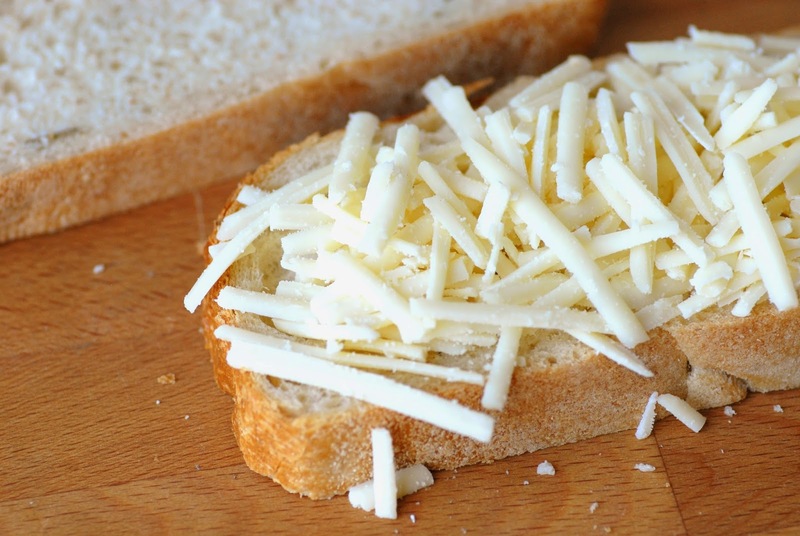 Oh, and to make it clear – to begin, you’ll only pile on half (about 1.5 oz) the cheese on one slice of bread. 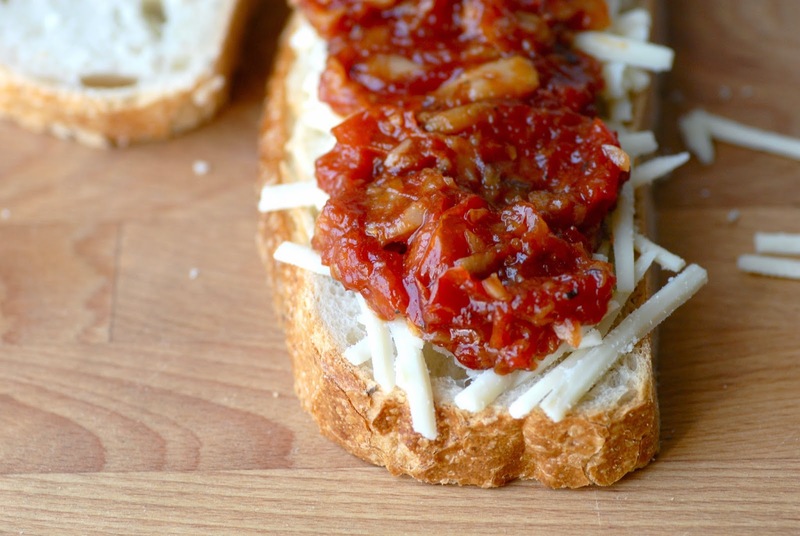 Next comes the candied garlic and tomato chutney which might just be my new favorite sandwich condiment EVER. It takes about an hour to make but believe me, once you make it that hour will become the most beautiful hour of your day because this stuff is totally insane and oh so good! RECIPE: In a small sauce pan, combine 1/4 a cup of roasted garlic cloves, 1.5 cup of diced campari tomatoes (or any other sweet tomato), 1/2 cup of red wine vinegar, 3 tbs of brown sugar, a pinch of red pepper flakes, a pinch of dried ginger powder, and salt and pepper to taste. Over a low flame, cook the mixture for about an hour or until its thickened and looks like it’s about to burn. As soon as it reaches this point, take it off the heat and give it a few pulses in a food processor so that there’s nice, consistently sized chunks of garlic and tomatoes. Let it cool for a few minutes before putting it on the sandwich. Ok now it’s time for the meat! When I was buying ingredients, I went EVERYWHERE trying to get my paws on some speck aka juniper smoked prosciutto. Well, it turns out that I couldn’t find it anywhere and i didn’t have time to hike over to Depanneur, my old stomping grounds, to get some so I went with my second option – jamon serrano. 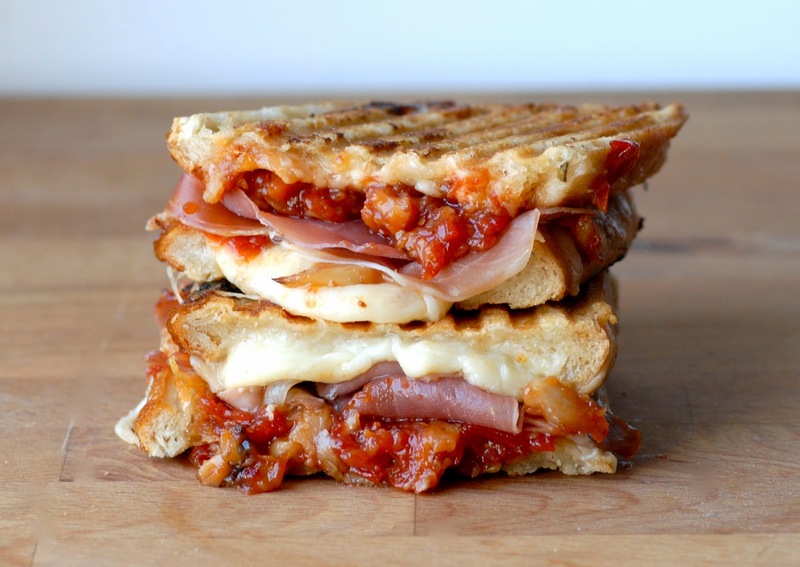 It’s salty, fatty, and it melts in your mouth which makes it perfect for grilled cheesin’. 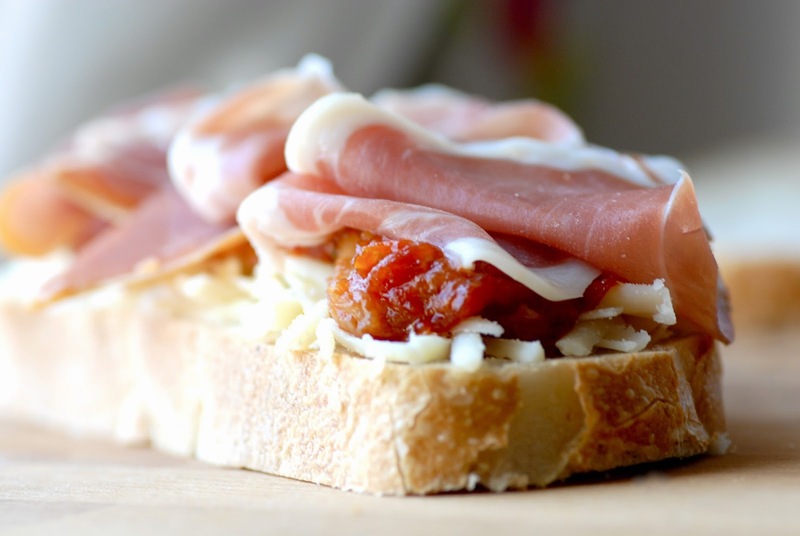 After making this sandwich, I think it turned out to be an even better choice than the speck. I’m an accidental genius… jk jk jk. Now pile on the rest of the cheese and top it with the other piece of rosemary sourdough. Butter this baby up and get it ready for grillin’. If you can’t find rosemary sourdough, just mix some chopped rosemary in your butter – it’ll taste the same! My homies at Emmi Switzerland sent me a super dope Cuisinart Griddler so I used that to grill up this bad boy but you can totally grill it on a stove top. In both circumstances, just put the heat to medium and let it cook for a few minutes until both sides are crispy and golden brown and of course until the cheese has melted! 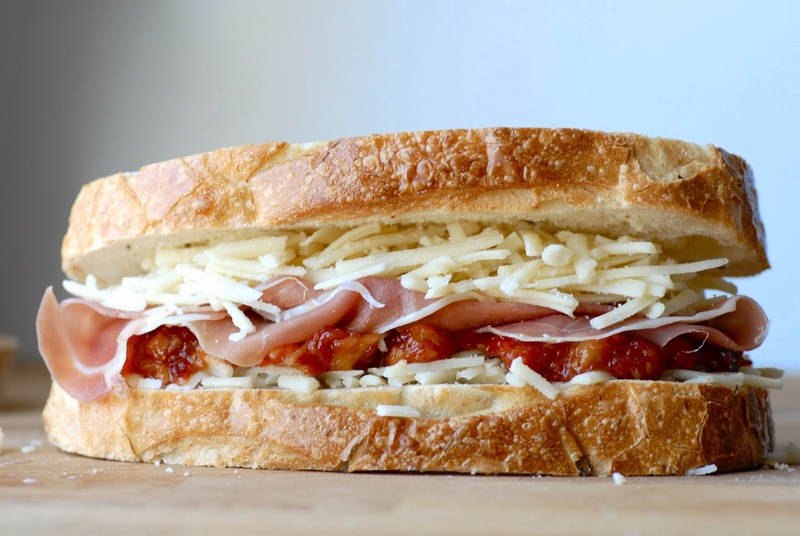 Before you dig in and pig out, make sure to let it sit for a second so that the cheese doesn’t ooze out of the sandwich. I mean, don’t get me wrong, licking the plate is a way of life in my book but you def want the cheese to stay on the sandwich so you get a perfect bite each time. And if you need like to pair this with some booze, I’d recommend pairing this super fancy ham and cheese grilled cheese with a super crisp and delicious cider like Angry Orchard’s Crisp Apple which is super fruity and clean and will help cut through the richness of the sandwich perfectly. K, gotta dip. Love you, bye. I had a newborn within just 2010 together with, but also started off ach lean, achieving regarding 30 35 kilograms at my pregnant.